One of the great pleasures of speakers at the monthly meetings is finding out about topics that you may know very little of or even not at all and being entertained and coming away feeling quite knowledgeable. A true learning experience. 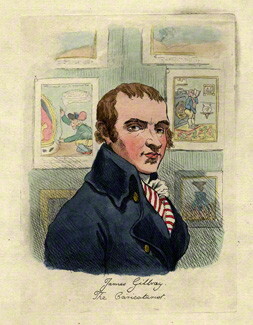 That was certainly the case when Ian Keable told us about James Gillray. One may recall the name or even the satirical engravings but maybe not make the connection. 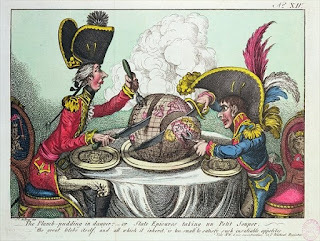 He was one of the most famous graphic artists of the eighteenth century and the pioneer of the modern political cartoon. This year (2015) is the bicentennial of his death - sadly he died insane in 1815. Copiously illustrated with his wonderful and graphic prints, Ian's talk focused on his life and works. I don't think we will ever again look at a cartoon in the same way. 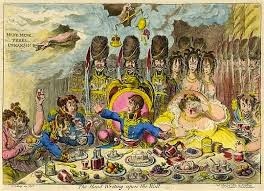 He made the link between modern day satirists and the history of the art. 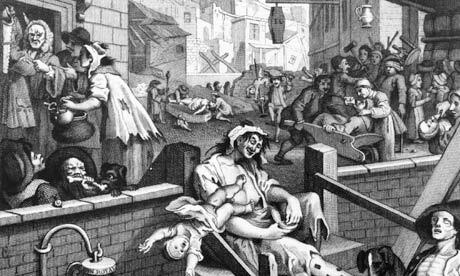 Those of us who had visited the Beefeater Distillery a few days before easily recognised Hogarth's Gin Lane displayed in the museum. Clearly many were interested as it was one of our biggest attendances with almost 80 people present. Thanks, Ian, for sharing your expertise with great aplomb. We thoroughly enjoyed it. historic houses and gardens within an easy drive of Edenbridge, to the best art exhibitions and galleries locally, including in London, and also perhaps explore possible links with the arts department of Surrey University in Guildford. Occasionally, we might combine an exhibition with a play, eg at the Yvonne Arnaud theatre in Guilford. Or, further afield, at Chichester's Pallant House Gallery and Festival Theatre. 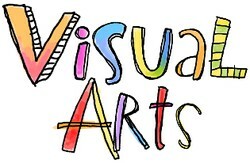 visual art will interact with theatre studies, gardens etc. I'd envisage a trip bi monthly or every six weeks starting next spring and organised by a small committee. If you are interested in joining the mailing list, or could help devise a programme, please send me your name, email address and phone no and I'll be in touch in January. We are hoping to start up a Tennis Group and to begin with we will meet fortnightly to have mix-in tennis sessions, playing at Cowden Tennis Club (2 hard courts) in Cowden Recreation Ground on Wednesday mornings at 10:00 am. Court charge is £3:00 per player. We can start with this arrangement but details of timing and frequency can be changed to accommodate the wishes of the group. There was a packed hall for the October Monthly meeting to hear local author Bob Ogley. Mr Ogley explained how he started his career as an author and publisher by producing a best selling book on the 1987 Great Storm after being turned down by mainstream companies. 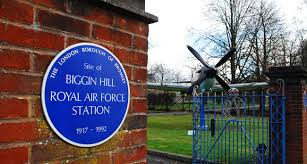 He proceeded to say how this lead him to produce several more books, the next of which dealt with the prominent role of Biggin Hill Airfield in the Battle of Britain and that this was going to be the subject of the afternoon's meeting. He then gave an illuminating and entertaining talk on the history of the airfield and those connected with it during the dark days of 1940. This provided an enthralled audience with a fascinating, sometimes amusing, and often poignant insight on those at the forefront of the battle that saved this Country 75 years ago. He admitted that he could have continued with many more anecdotes but time ran out and he reluctantly finished to receive the thanks of the Chairman and a well deserved round of applause from everyone present. Some courses will have additional charges for entrance fees etc. Speaker Steve Roberts, a former Detective Inspector with the Metropolitan Police, delivered an informative and entertain presentation titled, 'Tales of a Scotland Yard Detective". 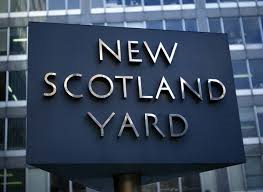 During his service, he worked at various locations in East and South East London and at New Scotland Yard on a number of specialist investigation units. His presentation detailed different aspects of criminal investigations supported by personal anecdotes and includeed an insight into the Flying Squad and the Kidnap & Specialist Investigation Unit. 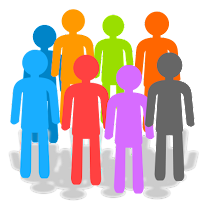 The aim of this new group is to enable members to get together informally once a month, either side of the monthly meeting, simply to chat and eat together without doing anything “worthy”! This could particularly appeal to those members who only attend the monthly meeting and who haven’t taken the leap into any of the topic groups. 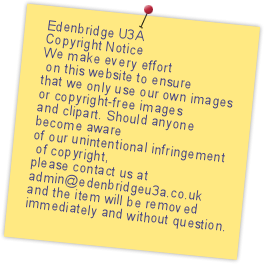 Friendships will be consolidated, new ideas for groups will emerge and support for Edenbridge U3A will be strengthened. “The Scone Rangers” is a pun that should certainly strike a chord with our generation. It reflects the all-important cream tea element! and acknowledges the wide range of interests of the group. Address: The Elms Tea and Coffee Shop at Chartwell Barns, Bough Beech Road, Four Elms, TN8 6ND Chartwell Barns is a very pleasant location at Four Elms with a garden centre, farm shop, tack shop, pet supplies and a fascinating array of salvaged garden ornaments. There is a coffee shop in the conservatory overlooking a large garden and a view up to Chartwell. Tea will be served at 3 pm. Loads of parking. Tables will be reserved for our group so unless we do a complete “take over” there will be other customers around us (opportunity to sign them up!) . Numbers are restricted to 20 - so first come, first served. The group will launch at Chartwell Barns for the winter months on the first or second Tuesday of the month. We may decide to try other venues in the spring and summer, although it is even more pleasant at Chartwell Barns in the summer where there is a sunny patio and garden to spread out into. A special vintage cream tea will be prepared for us consisting of sandwiches, sausage rolls, neat little cakes, scones, jam and cream and lashings of tea. The price will be £8 per head payable in advance. “Chatting” will be optional but certain to happen! 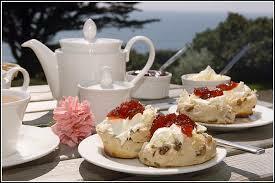 You can also book with Briar and pay for the next month at the end of the cream tea. You should have received your copy of Third Age Matters, the National U3A Magazine, recently. If you haven't already done so, take a look at page nine where you will see that we are included with our King For The Day from our June Monthly Meeting about the Magna Carta with Christopher Lloyd. To keep our website full of new and interesting material and articles we rely on our members. We regularly hear from a group of members who keep us informed about what is going on. Almost everything we receive is published. 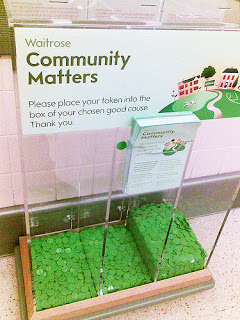 We can't be everywhere so we rely on you all to let us know what you've been up to. It would help us a lot if every group were to give us regular reports and photographs about its activities. It doesn't always have to be the group leader. Perhaps one person in each group could take responsibility for publicity. It doesn't have to be an onerous task but just a few words and a photo or two which will help to inspire others about your group. There is no need to format what you write. We will do all of that. 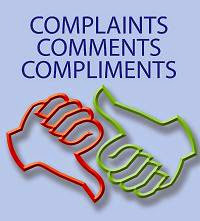 Just a simple report in an email about what you have done and what you are going to do will do. These articles will be placed on the Groups Page under the heading of your group. We will make a feature of some of them where a lot of information is provided. You too could be published. Why not give it a go? How are discoveries made, and how do scientists develop new cancer therapies? as they discuss their research into colorectal and skin cancers. Their talks will explore whether stem cells, and the emerging field of regenerative medicine, can be used to effectively treat cancers. There will be plenty of opportunity for questions. For more detail on the event have a look at the flyer. This is a free event but must be pre-booked. I'm sure that most of you reading this will be well aware who does this website. So for that reason, modesty does not allow me to write in my usual way about the monthly meeting so I will leave it to the words of others. After the formal meeting which every U3A must hold each year, we decided we would have a bit of fun to liven things up. If the AGM is what you're reading this for, you can find all of the details HERE. However if you want to know what happened afterwards, stay on this page. "Have to say, I have been to many an AGM but never had so much fun, and never recall laughing in any of them. Well done and thank you. Can't wait till next year!!!!" "That was the best AGM I've ever been to"
"A big thankyou for making the AGM such a resounding success. I know the members enjoyed your experimental method to prove that 'Death by PowerPoint' was not always true.....problem is what are we going to do next year?" Well, thankyou for those comments. There were many more and they were much appreciated! Our previous speaker, Chris Lloyd and his amazing coat of many pockets made it clear that he wasn't too keen on PowerPoint. As that was what the Committee had asked to prepare to let the members know about the groups available, I decided it had to be "With a Twist". I substituted his amazing coat for a Hi Viz Jacket, his tableau for a mini orchestra and his exciting talk with an interactive quiz. Volunteers had to perform and members had to join in. There was no escape and the laughter filled the hall. I'll let the photos speak for themselves. The prize for the quiz was to be an Edenbridge U3A Gold Member with a certificate to prove it. In the end, despite the difficult tie breakers, six of our female members shared the prize and they are photographed here with Molly, our outgoing Chairman. I don't know what happened to the men! It was all a bit of fun and a great time was had by all! Molly Ward, the outgoing Chairman, was presented with a bouquet of flowers in recognition of all of her hard work in the last year as Chairman and the year before as the Vice Chairman. She remains on the Committee. 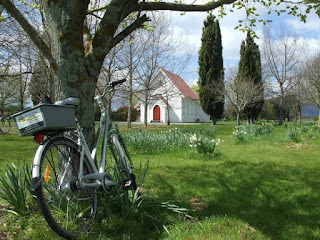 Are you interested in cycling? Do you want to explore the local area? Do you want to keep fit? Do you want to cycle with other like minded people? Do you prefer gentle cycling? This is a new group for Edenbridge U3A. It is for gentle cycle rides - not long distance. eg to Lingfield from Edenbridge and return. October 29th (Penshurst to Tonbridge). 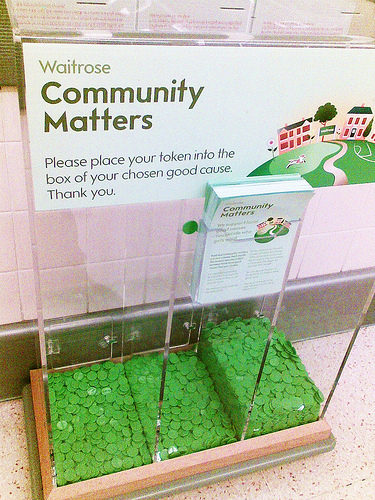 If you shop there and get one or more of the little green tokens, why not consider donating them to your local Edenbridge U3A. Every little counts! Edenbridge U3A opened its doors in Crockham Hill Village Hall to other U3As and local organisations as well as the general public for a free event about the Magna Carta in the month when it celebrated its 800th anniversary of conception. World history author Christopher Lloyd’s new talk took a giant perspective on 800 years in the fight for freedoms and liberties. Freedom and liberty are words that have been bounded around by politicians for centuries but what do they actually mean? How can we know if we are personally free? To what extent do we live in a truly free society? liberties from the sealing of Magna Carta by King John in 1215 to the present day. Using a giant 8m-long timeline, specially commissioned by Sir Robert Worcester, Chairman and the Magna Carta Trust’s 800th Committee, and a coat of many pockets containing key objects that serve as mnemonics, Christopher stopped off at 10 key moments in the last 800 years showing how today’s ideas of freedom and liberty have evolved through time. In his characteristic cross-curricular style. There was lots of audience participation and he kept us enthralled and entertained throughout the meeting.